India will be launching, on June 5, communication satellite GSAT-19 using its heaviest rocket which has a capacity to lift four-ton satellites to geosynchronous transfer orbit (GTo), the Indian space agency said on Tuesday. GSLV Mk-III satellite is a three-stage vehicle with two solid motor strap-ons (S200), a liquid propellant core stage (L110) and a cryogenic stage (C25). According to INdian Space Research Organisation (ISRO), the geosynchronous satellite launch vehicle Mark III (GSLV-Mk III) is scheduled to be launched on June 5 at 5:28 p.m. The satellite carries Ka/Ku-band high throughput communication transponders, besides the geostationary radiation spectrometer (GRASP) payload that would monitor and study the nature of charged particles and the influence of space radiation on satellite and their electronic components. 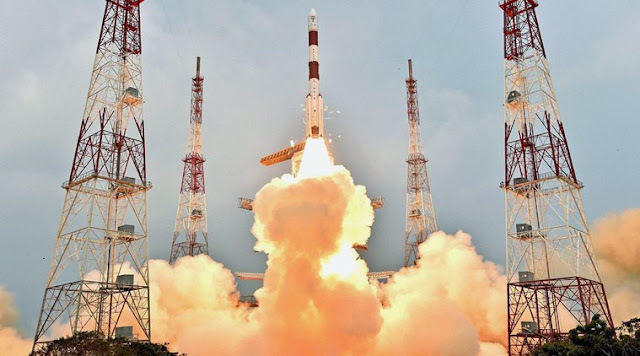 GSAT-19 also features certain advanced spacecraft technologies including miniaturized heat pipe, fiber optic gyro, Micro-Electro-Mechanical Systems (MEMS) accelerometer, Ku-band TTC transponder, as well an indigenous Lithium-ion Battery.